Nothing to do in retirement? Not here. Greencroft Goshen is a retirement and assisted living facility, but its residents are far from idle. From volunteering their time and energy to sharing their artistic gifts to putting their green thumbs to work, Greencroft residents stay active – and enrich the Goshen community at the same time! Here is just some of what Greencroft residents do to better our community. Greencroft residents love to give back by volunteering on and off campus. They can be found at local churches, schools, food pantries, and elsewhere. From July 1, 2016, to June 30, 2017, 258 on-campus volunteers gave 30,096 hours of volunteer service. 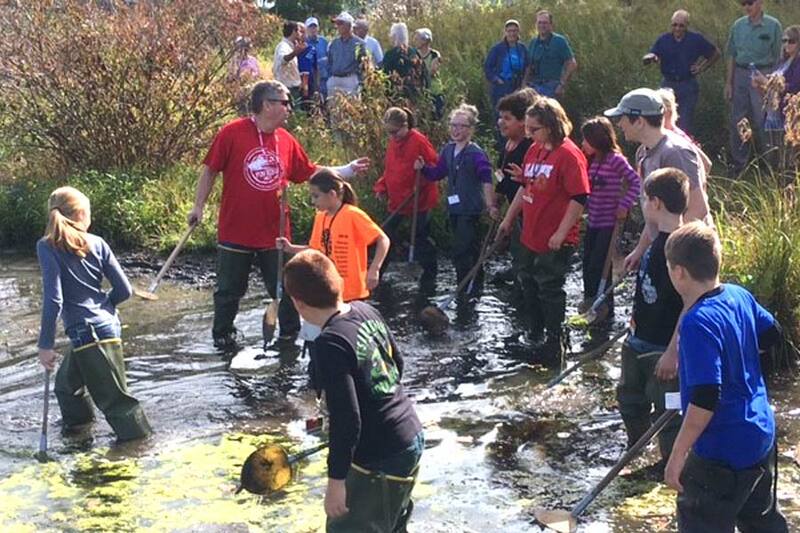 During that same time period, 121 off-campus volunteers contributed 26,224 hours. 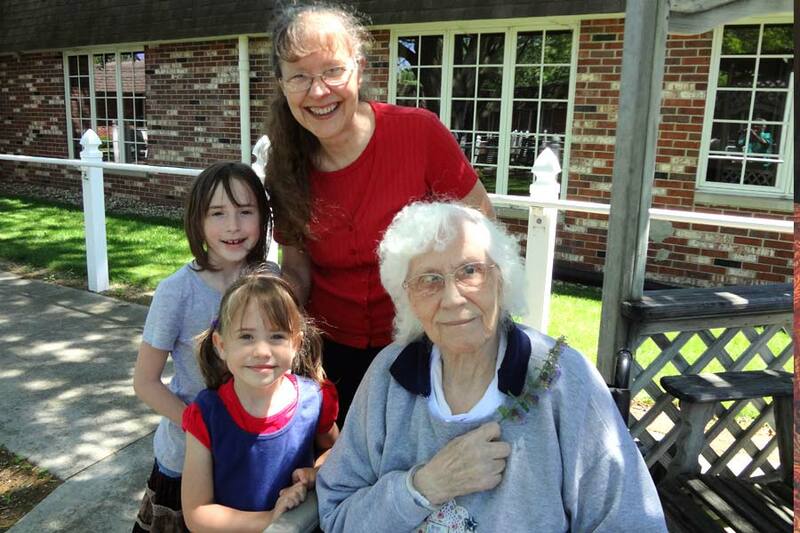 Volunteer Mari Glick (back center) stands with resident Doris and Mari’s granddaughters Kourtnee and Natalleigh. Greencroft volunteers are among the skilled crafters who knit hats for babies born at Goshen Health. 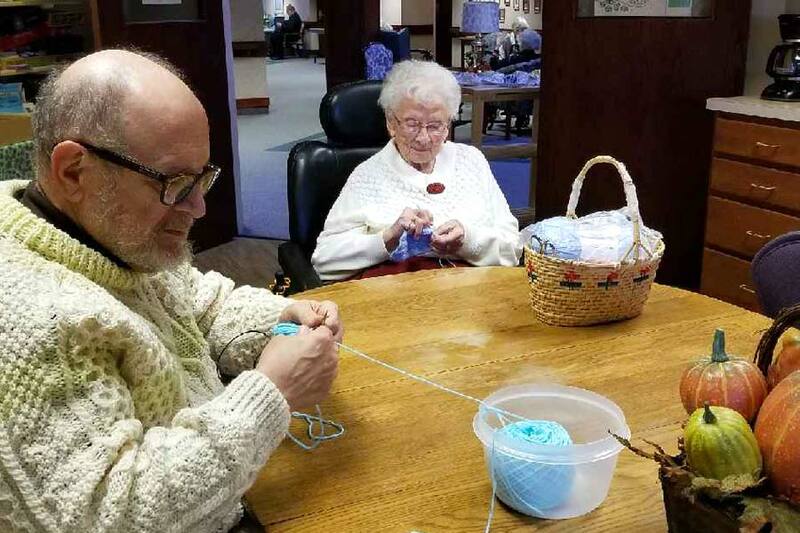 The hospital provides the yarn, and Greencroft provides the talent and TLC. 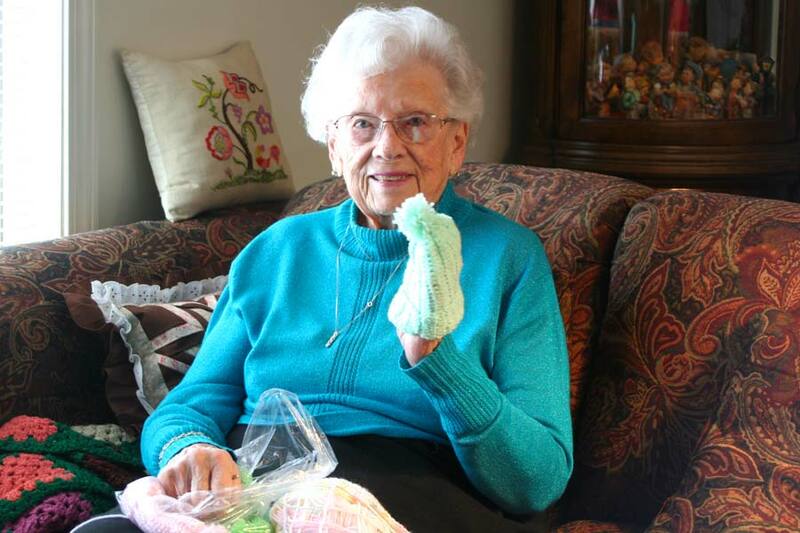 Currently, there are three to five Greencroft residents knitting hats, and each one makes two to four hats per week. Last year, Greencroft knitters made around 600 hats for the hospital! The whole community is invited to enjoy the beauty of Greencroft Goshen’s butterfly gardens, a project created by Greencroft Goshen’s Environmental Committee. 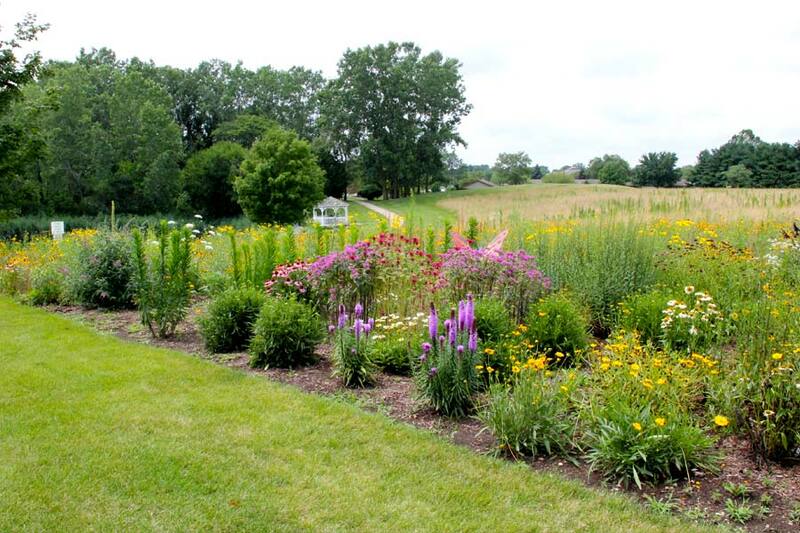 The butterfly garden is one of four gardens within the larger prairie grass and wildflower area on the east end of campus near Juniper Place. The garden features a metal butterfly sculpture and house as installations. 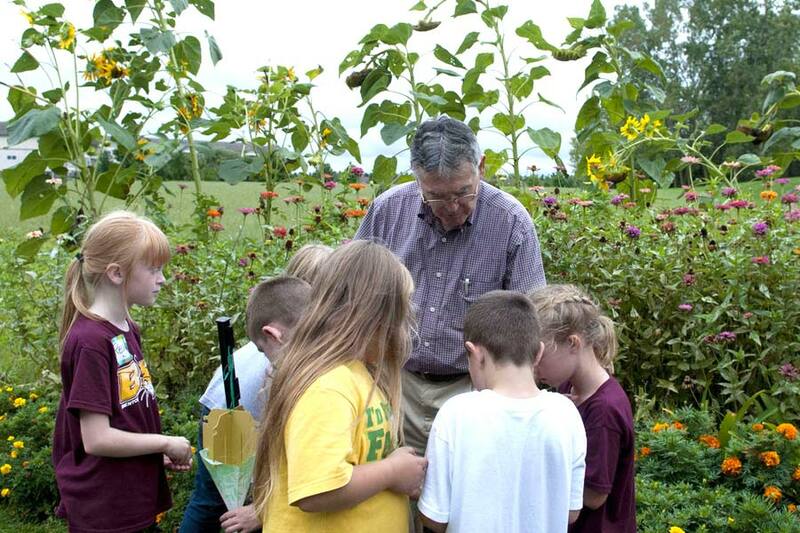 Greencroft Goshen resident shows off the Butterfly Garden to local students. 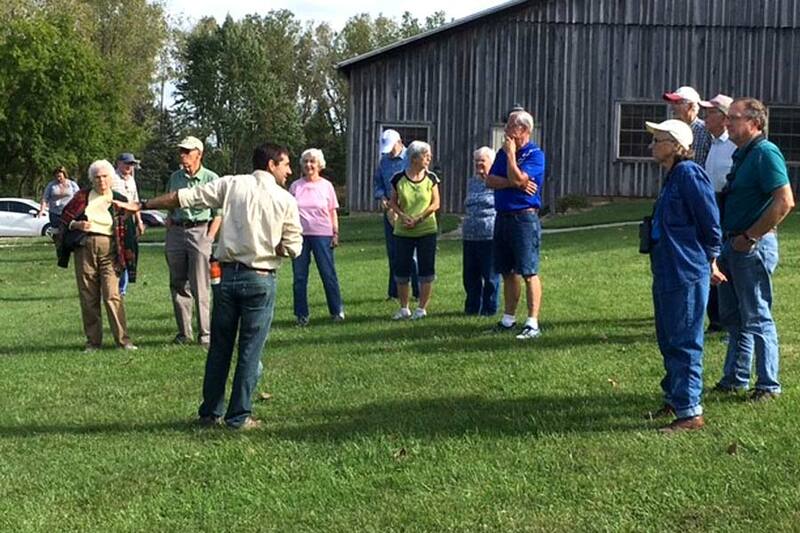 A few years ago, Greencroft and Goshen College partnered to organize a program pairing senior residents with GC students. They spent time together one to three times a month doing a variety of activities. These included board games, visiting, making cookies, and more. 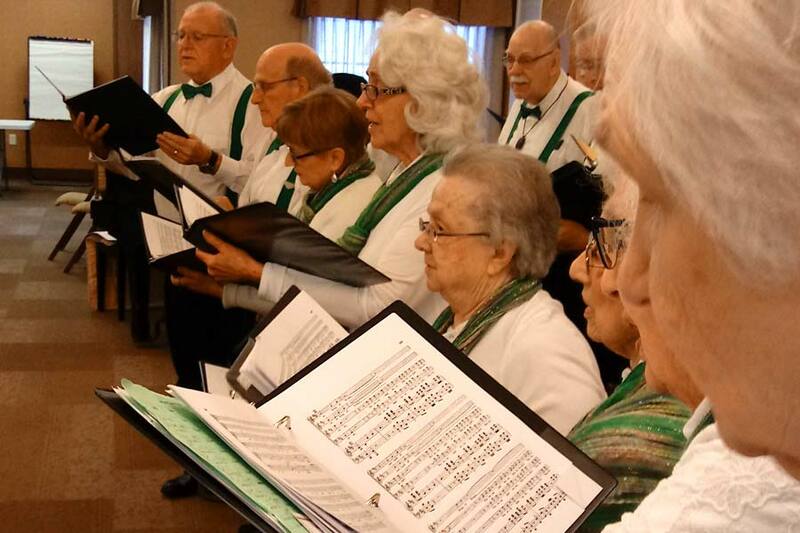 Several Greencroft residents lend their golden voices to the Evergreen Singers. Directed by Don Steiner, the Singers are a Goshen-based group made up of vocalists older than 50. 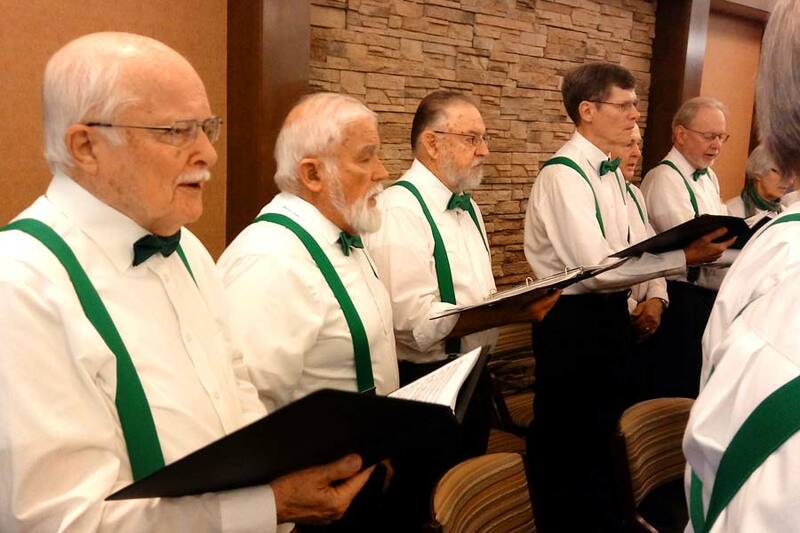 The Evergreen Singers regularly share their talents in concert! Evergreen Singers performing on campus at the Metzler Meetinghouse. The Evergreen singers perform not only on the Greencroft Campus but also can be found performing at venues and fundraisers around Goshen. The Greencroft community loves music, and loves sharing music with young people. 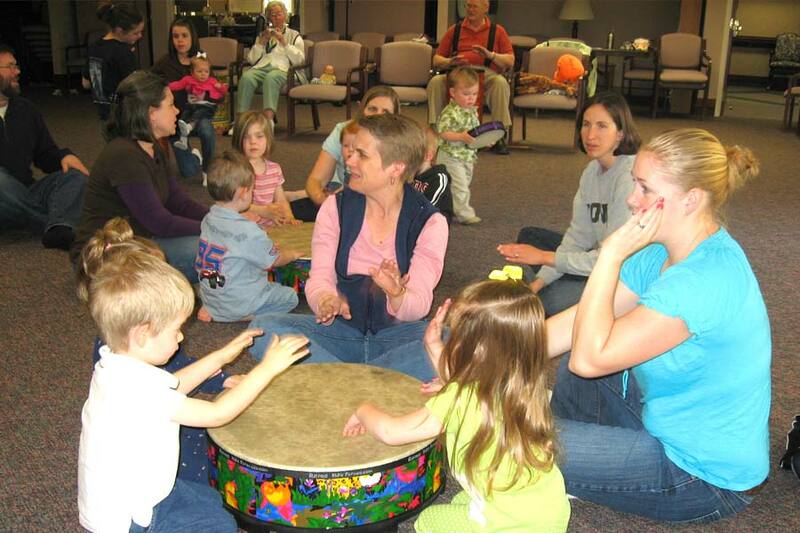 Every Friday, Greencroft hosts two classes of Goshen College’s Music Together program, an early childhood music and movement program for children from birth to age 7 and their grown-up caregivers. Instruments are passed around and played during the classes, which include both children and “grandfriends” (Greencroft residents). What does everybody learn? For starters, that music is a thing of joy no matter one’s age. Greencroft residents have been out of school for a while, but they’re far from done with learning. 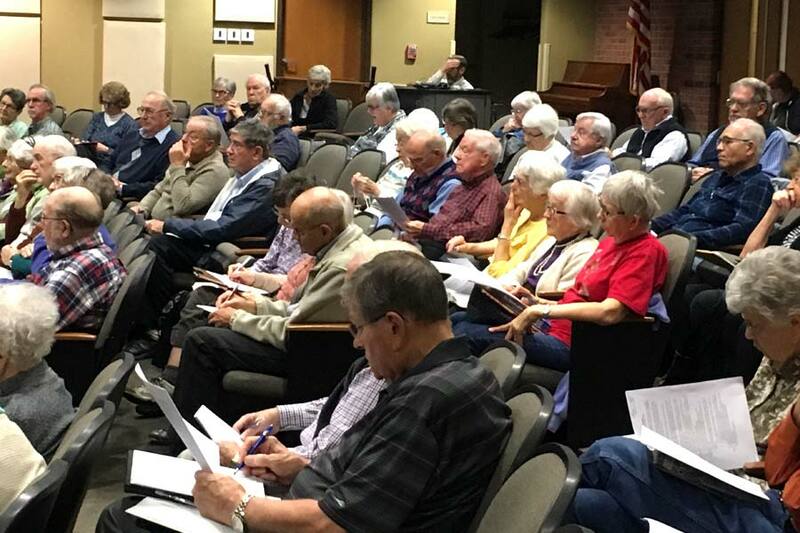 Thanks to the Lifelong Learning Institute of Elkhart County, they have easy access to continuing education. Classes take place at Goshen College, Greencroft, and other locations in the community. Sessions are scheduled in the fall and spring, with a lecture series mid-winter. There are no tests or grades, and no prior studies or degrees are required. During the last session, nearly 600 senior students enrolled in the classes, and the lectures each had attendance of around 180 people. Senior Students taking a class in Jennings Auditorium on Greencroft’s campus. 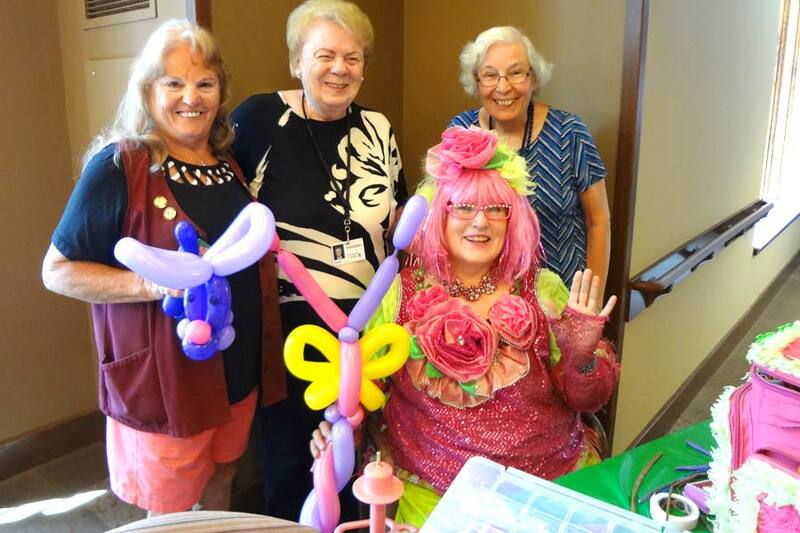 Jeannette Castellano, Carol Hill, Lora Miranda, and “Rosie the Clown” cheer up residents. The Greencroft team cares for residents day-in, day-out – and when they need help themselves, Greencroft comes through. Life comes with unexpected challenges, and Greencroft’s benevolence fund is there when employees face a sudden financial emergency, such as having to pay a utility or medical bill. Greencroft doesn’t view the fund as charity – it’s a way of saying, “Thank you.” Greencroft giving doesn’t stop there. Generosity is part of its mission, one made possible from donations from both Greencroft residents and the larger community. In the fiscal year 2016, for example, Greencroft Communities provided more than $4.9 million in unreimbursed services!